A sizzling hot trend in social media happens every Thursday. From celebrity baby photos to average social networking fans sharing yesteryear family celebrations, millions of people are having fun and getting nostalgic by sharing their decades of rediscovered legacy photo snapshots during ‘Throwback Thursday’ [“#TBT”]. Even businesses are adopting this online sensation by sharing long forgotten photo flashbacks when their companies were just starting out. Casinos in Las Vegas are a fun example to view legendary buildings of yesteryear and famous luminaries on immense vintage marquee signs which are no longer with us. 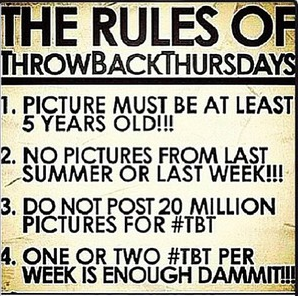 “Posting old pictures from your childhood to 1980’s-style fashions on leading social media platforms is easy, just include the “TBT” Hash tag. The challenging part is how to get thousands of analog pictures and 35mm slides digitalized; that is where ScanMyPhotos.com plays an integral role. Nearly 45% of all our photo digitization orders worldwide are linked to people participating in ‘Throwback Thursday,’” said Mitch Goldstone, president & CEO, ScanMyPhotos.com. As Yoda once said, “Graduations lead to emotions, emotions lead to stress” (OK, I may have that a little wrong) but a well prepared photographer will have one less thing to worry about on this big day for the graduate in your family. Follow these tips and tricks to capture this important event. Lastly, take some test pictures the night before to ensure all is working properly.